One of the clearest emerging directions for mental health interventions in the 21st-century is the need to acknowledge a spiritual dimension in life. Spirituality partly involves a belief in some larger consciousness beyond ourselves that affects our lives. Religious people might refer to God, whereas others might consider that they receive messages or guidance from the universe. Mental health practitioners who ignore this widespread belief are likely to be less effective helpers to many who access their services. I was startled to hear at a recent international psychotherapy conference that more people pay to receive help from alternative healers, including psychics, mediums and other spiritual advisers, than conventional mental health practitioners. It was speculated that therapy as usual fails to “sing to people’s soul”. Apart from ignoring the spiritual dimension it can same too mundane and reductionistic in its explanations. It is quite limiting to consider sufferers’ challenging life experience mainly in terms of biochemical imbalances in their brain, their habits or their consciously accessible negative thoughts. I think this is partly why I have so long been intrigued by my clients’ and my own experiences of synchronicity, or meaningful coincidences, and what might be gained from them. Many people mistakenly believe that if you have a scientific bent then you need to believe that any coincidence, however striking, only occurs as a result of random chance. In my view that’s an example of overly reductionistic thinking. Many people believe that remarkable coincidences have non-randomly altered their lives in a way that seemed “meant to be”. This might include a very improbable coincidental encounter with their future life partner or someone who helped them solve a complicated problem. Many believe that synchronistic experiences have opened up uncommon career prospects or pointed them toward their life destiny. On the other hand, negative events which block your current life path can also be considered to be meaningful, possibly leading to a change in direction or approach which might prove to be much more worthwhile. Not all meaningful coincidences are positive. However, a scientific mind involves more than being appropriately sceptical. Being a good scientist first involves being a good observer, and then testing one’s inferences against objective evidence. In the case of synchronicity this includes exploring whether strikingly meaningful coincidences can be adequately explained by random chance alone. I believe many examples I’ve heard can’t be realistically explained away like that. We might keep in mind that the Swiss psychiatrist, Carl Jung, developed his ideas of synchronicity following discussions with Albert Einstein about his unconventional notions of space and time. Jung wrote about synchronicity decades later with the active encouragement of Wolfgang Pauli, a founder of quantum physics. There is no inherent conflict between considering science and soul. Interestingly, the first international Science and Spirituality conference will be held in Vancouver in June this year. Things are changing. 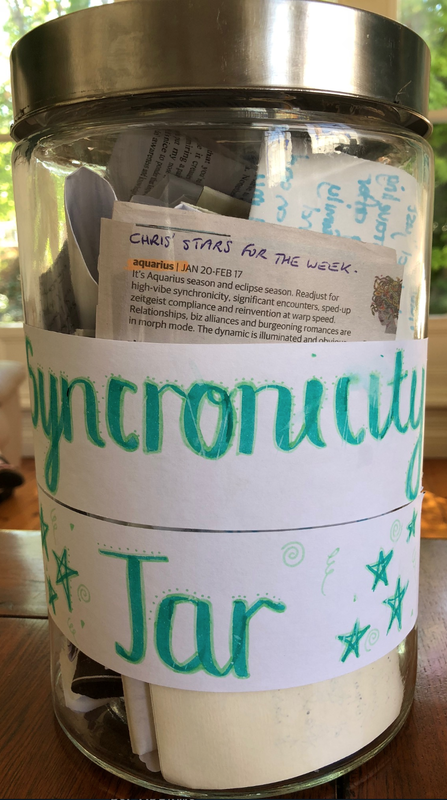 Chris Mackey is a Fellow of the Australian Psychological Society and author of Synchronicity: Empower your life with the gift of coincidence. Chris is the author of Synchronicity: Empower your life with the gift of coincidence (see www.synchronicityunwrapped.com.au for additional articles, radio podcasts, etc.). His short videos on synchronicity are available here. See Chris’s main practice website resources page for other blogs and information promoting an uplifting view about mental health and wellbeing. Click here for Chris’s radio interview podcast with Dr Bernie Beitman about synchronicity and positive mental health.